Below is a list of features available as part of the hosting packages we offer. 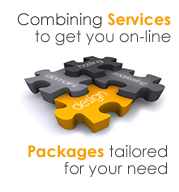 In some cases a set up charge would be required to integrate the features into your website. Please Note: Our hosting packages are invoiced on an annual basis with the invoice issued before the renewal date. Clients wishing to cancel the package need to contact us before the renewal date in order for us to cancel the package for the coming year. © 2012-2017. All Rights Reserved.